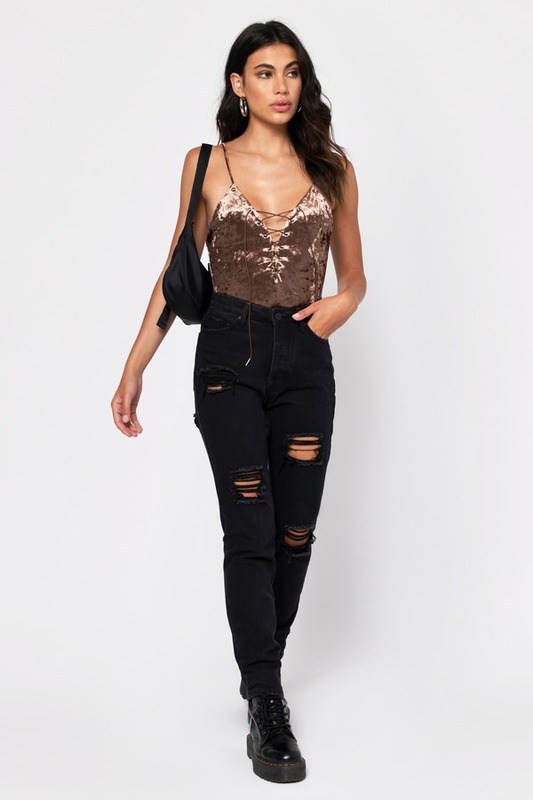 Check out Tobi's Open To It Velvet Lace Up Bodysuit Lace yourself up and get ready to go dancing: the Black Open To It Velvet Lace Up Bodysuit is one to add to your going-out rotation. The velvet bodysuit has an open back with delicate spaghetti straps and a deep V neck with lace up tie. We like this evening bodysuit with distressed denim. 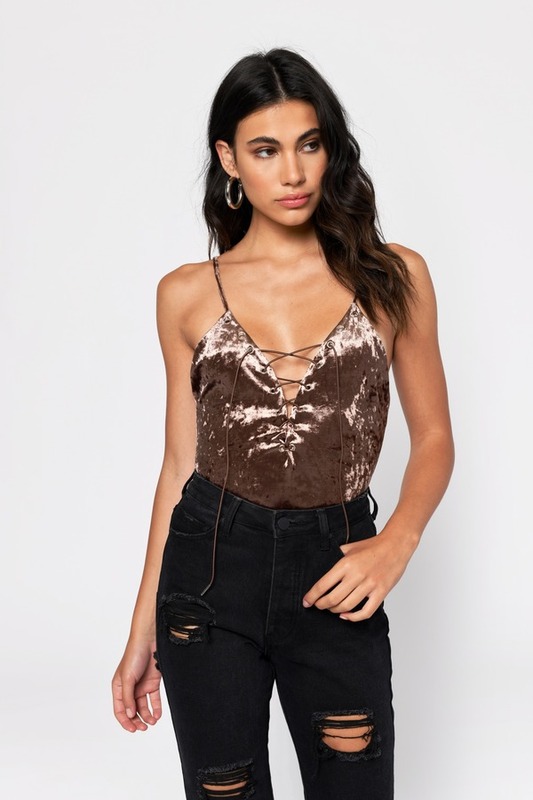 Lace yourself up and get ready to go dancing: the Mocha Open To It Velvet Lace Up Bodysuit is one to add to your going-out rotation. The velvet bodysuit has an open back with delicate spaghetti straps and a deep V neck with lace up tie. We like this evening bodysuit with distressed denim. Lace yourself up and get ready to go dancing: the Wine Open To It Velvet Lace Up Bodysuit is one to add to your going-out rotation. The velvet bodysuit has an open back with delicate spaghetti straps and a deep V neck with lace up tie. We like this evening bodysuit with distressed denim. Lace yourself up and get ready to go dancing: the Black Open To It Velvet Lace Up Bodysuit is one to add to your going-out rotation. The velvet bodysuit has an open back with delicate spaghetti straps and a deep V neck with lace up tie. We like this evening bodysuit with distressed denim. Mocha and Wine modeled on a size Small.